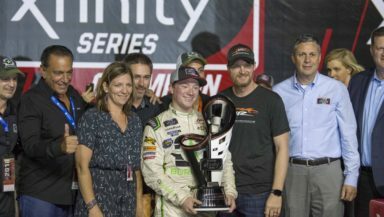 DAYTONA BEACH, Fla. (Nov. 17, 2018) – Following an outstanding rookie season, Tyler Reddick is now the NASCAR Xfinity Series champion. The driver of the No. 9 JR Motorsports Chevrolet capped off an extraordinary season in grand fashion – by capturing the 2018 NASCAR Xfinity Series championship with a stirring victory in Saturday’s Ford EcoBoost 300 at Homestead-Miami Speedway. To take the title, Reddick outdueled his Championship 4 competitors Cole Custer (second), Daniel Hemric (fourth) and Christopher Bell (11th). The Corning, California native showed his talent on the racetrack throughout the entire season and won the opening race of the season at Daytona in the closest finish in NASCAR national series history, immediately securing his spot in the Playoffs. Once the Playoffs began, Reddick upped his performance to another level, recording a top-10 finish in all but one postseason race. Reddick finished the season with two wins, seven top fives and 20 top 10s. Reddick was also crowned the 2018 NASCAR Xfinity Series Sunoco Rookie of the Year. The title is the second consecutive driver championship for JR Motorsports and third in the last five years. The team also won the 2014 title with Chase Elliott and 2017 with William Byron. The No. 00 Stewart-Haas Racing Ford won the 2018 NASCAR Xfinity Series Owner Championship, finishing second ahead of fellow Championship 4 owner contenders No. 20, No. 21 and No. 42. It is the first NASCAR Xfinity Series owner championship for Stewart-Haas Racing. On the strength of 15 victories, Chevrolet won the 2018 NASCAR Xfinity Series Manufacturer Championship.